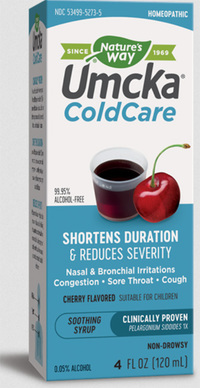 Umcka Cold Care Syrup - Cherry Flavor, 99% Alcohol-Free, 4 fl oz / 120 ml (Nature's Way) - Penn Herb Co. Ltd. Unlike other remedies that mask symptoms, Umcka South African Geranium extract actually helps you recover faster! It soothes cough, congestion, sore throat, minor aches, and other symptoms associated with the common cold and bronchial irritations. Umcka ColdCare® is made from Pelargonium sidoides - a species of South African Geranium. It works with the immune system to help support the body’s own natural antiviral defense mechanisms. This delicious, easy dose syrup is quickly absorbed by your body and ready to take on your cold symptoms. Safe for ages 6 and up. ACTIVE INGREDIENT: Pelargonium sidoides 1X. INACTIVE INGREDIENTS: Aronia juice, Citric Acid, Fructose, Natural Cherry Flavor, Purified Water, Vegetable source Glycerin. (0.6% Alcohol). Shortens duration and reduces severity of symptoms associated with the common cold and throat/sinus/bronchial infections: congestion, hoarseness, cough, minor aches, headache, sore throat. Helps loosen phlegm (mucus) to make coughs more productive. For best results, use at first sign of symptoms & continue to use for an additional 48 hours after symptoms subside. Adults & Children 12 yrs. & older: 5 ml 4-5 times daily. Children 6-11 yrs: Take 5 ml 2-4 times daily. Child under 6: Consult doctor.